One of our most recent projects is the transcription of 44 receipts written and signed by William Blake. They present a few new problems, such as how to transcribe the markings between numbers — their version of a decimal point, which looks a lot like two commas. Another unique aspect is the stamp, which appears on 19 of the receipts. Initially there was uncertainty over how to classify the stamps, and they were referred to as ‘seals’ for a few months. 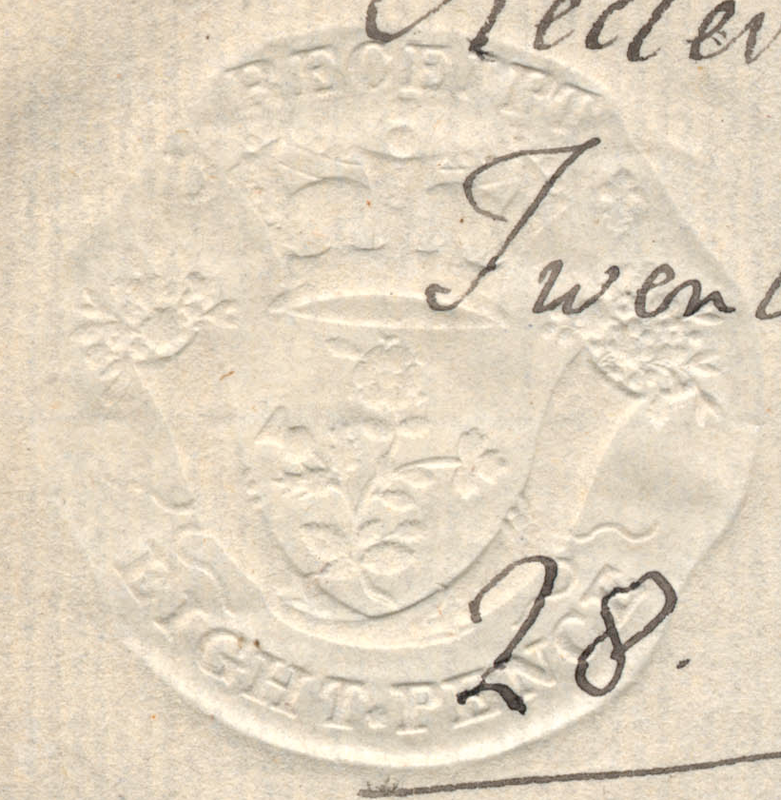 However, consulting some reference works on philately told us that the correct term is ‘embossed revenue stamp’. These actually have a longer history than postage stamps, as they were used to denote the payment of tax on legal documents such as receipts, and before income tax became standard they were used by governments as a main source of revenue. 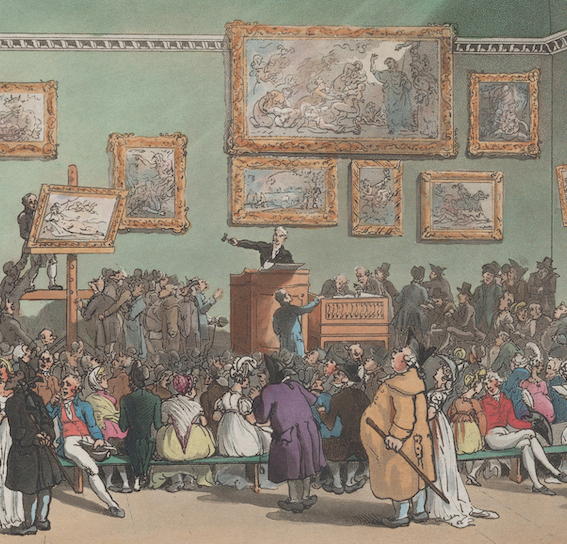 They can be classed as either ‘documentary’ or ‘proprietary’; the latter describing stamps used for paying tax on goods, which are generally affixed to the item in question, and the former being stamps attached to legal documents. The Blake receipts carry documentary revenue stamps. Revenue stamps have never been as interesting to collectors as postage stamps, however, and the largest catalogues of stamps, such as the Scott Standard Postage Stamp Catalogue only list a few incidental revenue stamps. This is slowly changing, but the general lack of interest has meant that there is no comprehensive database identifying various kinds of revenue stamps, only a few specialist collections. Moreover, these collections largely focus on the stamps from former British colonies: these revenue stamps are usually very colourful, elaborate and contain specific cultural details relating to the history of the colony. Comparatively, our Blake revenue stamps are all uncoloured, and most feature the same image (a union jack on a shield, under a crown) and the same text (“mon dieu et mon droit”), both quintessential representations of the British monarchy, and consequently rather uninteresting. With little information available on these stamps, we have 3 main problems: 1) how to read the (often faded and overwritten) stamps without a clear sense of what to expect, 2) how to identify different types of stamps (the meaning of the image/text combinations), and 3) how to represent the complexity of these stamps in in our encoding of the transcription. two) Without another taxonomy to work off, I’ve been using a provisional one based on a set number of images and texts which are found in different combinations. The stamps can be categorized most easily by cost, as they clearly represent values from two to eight pence. The image is harder to categorize, as it is made up of a number of elements which are found in different combinations, and which are not always represented in the same way; for example, I am using ‘vines’ to designate the long, vine-like plants usually depicted at the sides of the image, but these differ in shape, and ideally I would like to find a more accurate description for the different variations. In the absence of any colour, I am also hesitant about describing the commonly-seen image (of a standard cross over an x-shaped cross) as a “union jack”, although this seems like a good enough description for now. Other common features are thistles, crowns and belts, but these are easily identified and described (although I still need to do more research on what these symbols mean — I found conflicting meanings for the ‘belt’ image including “loyalty” and “readiness to serve the public”. The text is a little more complicated to categorize, since I can divide it into 4 parts: text denoting motto (which encircles the central image), text denoting cost of stamp (at the base of the stamp), text denoting purpose of stamp (found both at the base of the stamp, under the cost, and encircling the central image, outside the motto) and text on the upper-left hand side, which I don’t yet understand. As this only gives a text transcription, it is not a great model for the majority of stamps, and certainly not for the Blake receipts. This also touches on another problem that users of the site have noted, that it is not clear whether <stamp> is meant to contain a transcription of the text, or a description of the contents. 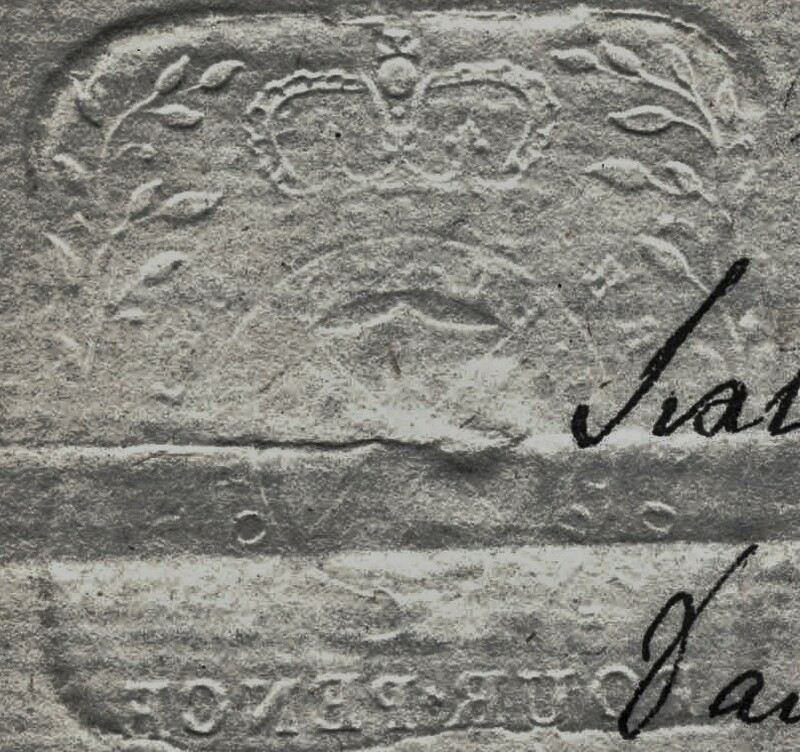 The revenue stamps on the Blake receipts seem to be a unique problem which has no clear solution. 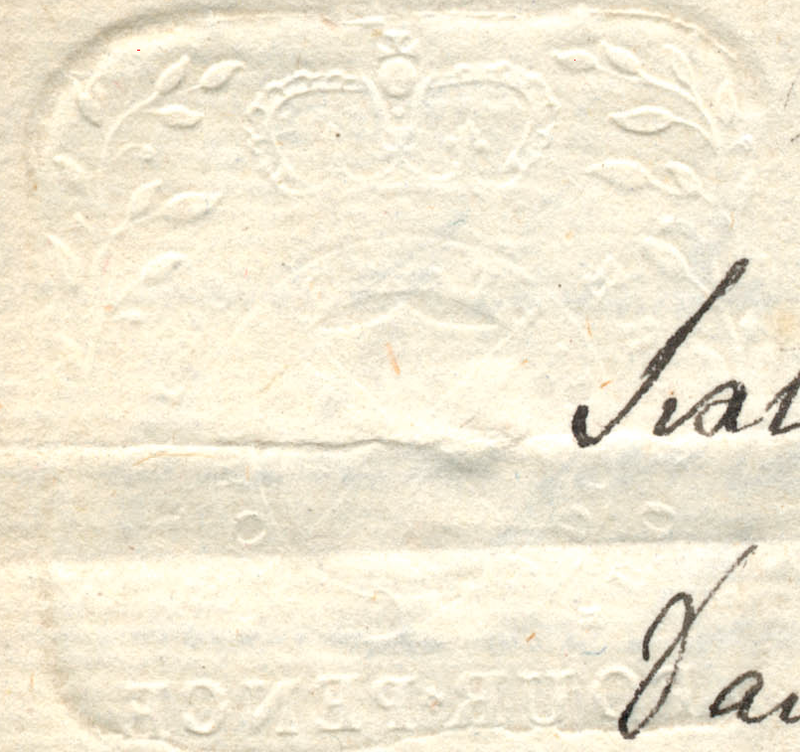 Pingback: Revenue Stamps on Receipts | Uncategorized | Aggregated blogs on Romantic Studies - please click through to read full posts.